I was on a Stoic forum today and someone posted that they are, "thinking about how to combine stoicism with feminism." I made the mistake of scanning the comments and saw far too many people scoffing at the idea. Now, I do not know what "combining" these two ideologies means. Feminism and Stoicism both offer ways to view, interact with, and critique the world and they are both adequate to the task on their own. I'm not certain why mixing is required rather than simply wielding these two different tools at the appropriate time? One can put forth a feminist critique as a Stoic. One can take Stoic actions as a feminist. What I do know is that anyone claiming that Stoicism and feminism are incompatible with one other is objectively wrong. Stoicism is often viewed historically as a proto-feminist philosophy. Feminism, in its insistence that woman should have equal access to society's power and resources, and that a woman's personal autonomy should be viewed as equal to a man's, also comports with Stoicism (when Stoicism is at it's best). Simply stated, Stoicism not only demands that practitioners view all rational/social beings as equals in virtue, but it also expects practitioners to change the world around them until it embodies that truth. The clearest examples of Stoic "proto-feminism" are found in two talks given by Musonius Rufus, the teacher of the better known Stoic, Epictetus. These talks are titled, from the lecture showing that women also should study philosophy, and, from the lecture on whether daughters should get the same education as sons. The basic argument in each of these lectures is the same; women and men are equal in reason, in their senses, in their bodies, and in their need to properly express human nature; therefore equal education is necessary. The daughters lecture contains the strong Stoic truth that, "it is obvious that there is not one type of virtue for a man and another for a woman." The women lecture ends with a dramatic statement. "The doctrine of the philosophers encourages a woman to be happy and to rely on herself." Now these same lectures contain views that also show the inadequacy of Roman Stoic thought. There's a reason that they are, at best, proto-feminists or even just inadequate feminists. The Roman Stoics were very married to the idea that people had natural roles to play in life. Their implementation of those roles was rather conservative and lends itself easily to a feminist critique. However, even within that conservative Stoic framework, there are seeds for more expansive thinking. In the fifth paragraph of Musonius' daughters talk, he addresses work. He makes the claim that certain jobs are naturally suited for men or women due to conditions like physical strength, etc. Even within that argument, Musonius says, "but sometimes, when a health condition or circumstance requires it, or when opportunity allows it, some men could reasonably undertake some of the lighter tasks...and women in turn could perform some of the harder ones." Already in 50 CE a Stoic teacher could easily see that work should be done by those who can do it. Broad categories like men's work/women's work might be used as general descriptors but become ridiculous if used to create barriers to simply getting things done. The person who should fill a role is the person who can fulfill the work of that role. The next generation's Stoic teacher, Epictetus, would also point out that the Roman view of women does not stem from a woman’s real potential but from what a woman is constrained to be. In his own talks about women and philosophy Epictetus says that young women primarily concern themselves with beauty and attracting mates specifically because that is the only way they are valued by society. It's a rational choice for them to take up supposedly "frivolous" things. He argues that if women had access to a philosophical education then they would display a philosophical mind. We do not have any evidence that ancient Stoics did a good job advocating for changes that would have allowed women more access. We do know that their philosophy had room for such change if the possibility had been made clear. The Roman philosophers were not used to structural critiques of power, but the examples of Stoic thought I've given already make it clear that they could have taken in such an analysis and adjusted accordingly. Furthermore we can state with certainty that any belief that holds women as lesser than, or rightfully subject to, men stands fully outside of Stoicism. Human moral and ethical equality is fundamental to Stoic thought. Feminism and Stoicism are compatible. In fact, feminist thought can not only be wielded by the Stoic, but it should also be turned on Stoicism as a lens to show where the philosophy is less than it's best. The critique can only make Stoicism healthier. The whole philosophy was relatively dormant for two thousand years. There's a lot of dust and grime to clean off if it's to become vibrant in the present. March 6, 2019 by Matt Van Natta. I've been thinking a lot about Stoic progress. It's been on my mind since I started creating Episode 16 of the podcast and I finished that in April of 2018 so, as I said, it's been a while. Primarily I want to know that I am growing. Because if I'm not, what's the point? But I also think about the Stoic community. What helps advance the philosophy? What moves practitioners further towards flourishing and what, conversely, creates roadblocks? While thinking on such things, I have been rereading Seneca's letters to Lucilius. A few days ago Letter 33 drew me in, because the theme overlaps with my present fixation. In it, Seneca shoots down "soundbite Stoicism," pooh-poohs veneration of the early Stoics, and advocates for a lived, embodied Stoicism. Seneca did not use the term soundbite, of course. Instead He speaks against the use of quotes and aphorisms. First, he claims that pithy quotes are the sign of an uneven philosophy. Apparently good quotes stand out because the writing around them is subpar? He goes on to say that memorizing such sayings is immature. In the modern context this is quite a statement. Today's Stoics certainly enjoy a good ancient quote. One of the easier ways to gather likes on social-media is to post a simple quote from one of the Stoics. "I needed to hear that today," and, "wow," will soon flood the comments. Even in Seneca's own time, Stoic students were definitely using memorization as a tool for growth. I mean, what's pithier than the famous, "Bear and forebear?" And yet, Seneca didn't trust memorization. This is because he believed there was a wide divide between remembering something and knowing something. As he said about memorizers, "they never venture to do for themselves the things they have spent such a long time learning." Here is Seneca's real issue with quotes. He saw a danger in believing that memorizing philosophy was as good as wise action. The teacher, Musonius Rufus, would have agreed. As he said, "practicing each virtue always must follow learning the lessons appropriate to it, or it is pointless for us to learn about it." It doesn't matter if we can recall philosophy, it matters that we embody philosophy. It's this idea of embodied Stoicism that I tried to speak on in Episode 16:Progress, and that has remained with me for nearly a year. On the theme of living out our philosophy, Seneca finds reason to deride the veneration of earlier thinkers. "But in the case of an adult who has made incontestable progress it is disgraceful to go hunting after gems of wisdom, and prop themself up with the briefest of the best-known sayings, and be dependent on memory as well; it is time they stand on their own two feet. They should be creating such maxims, not memorizing them. It is disgraceful that one who is old or in sight of old age should have a wisdom deriving solely from their notebook. 'Zeno said this.’ And what have you said? 'Cleanthes said that.’ What have you said? How much longer are you going to serve under other's orders? Assume authority yourself and utter something that may be handed down to posterity. Produce something from your own resources." What does it matter what Zeno once said if we don't have thoughts of our own? 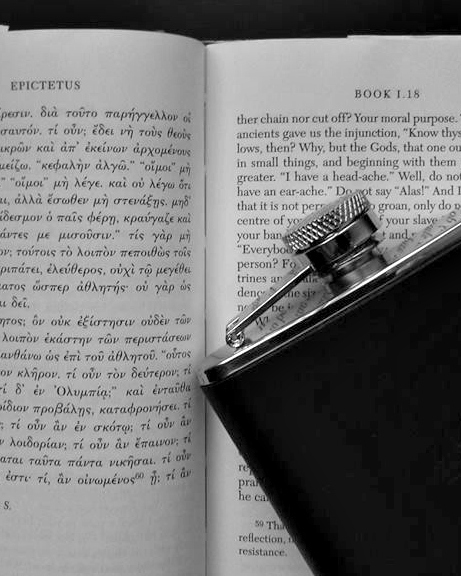 Seneca saw such “notebook philosophy” as not only dangerous for the individual but for the philosophy. First, Zeno-said, or Epictetus-said Stoicism calcifies the philosophy. As he put it, "these people who never attain independence follow the views of their predecessors even in matters in which everyone else without exception has abandoned the older authority." Second, those who simply parrot the philosophy can never expand it. "No new findings will ever be made if we rest in the findings of the past." It's Stoicism's capacity for growth that excites me; whether it's an expansion of practices that help individuals flourish, or the expansion of our ethics as we apply Stoicism to modern social issues. Seneca had a similar wish for a vital Stoicism. We also share a concern that the world marks progress incorrectly and, therefore, leads people to a pallid stoicism that can not fulfill the full promise of philosophy. Letter 33 is certainly worth a read. After that though, it’s fine to forget the words if, instead, we act with the freedom we have to be our own guides. February 13, 2019 by Matt Van Natta. I've been having trouble finding peace. Both my wife and I need to change jobs soon and I'm not certain how that's going to happen and what it will entail. Because of this I've been spending a lot of time dwelling on the future, which is a terrible idea. In fact, I'd say that the reason I'm not at peace is specifically because I'm thinking about the future. Stoicism would tell me the same thing. It's fundamental to Stoicism that the only moment we ever have access to is the present moment. The past is out of our reach and can never be changed, the future simply isn't, and there's frankly no guarantee that it ever will be. As Seneca put it, "These two things must be cut away: fear of the future, and the memory of past sufferings. The latter no longer concern me, and the future does not concern me yet." When we Stoics think about what we can and can't control, it should be obvious that we can only use our energy in the here and now. And yet it can be so very difficult to keep our thoughts in the present. I find it interesting that Seneca uses, "cutting away," when addressing the past and future because another Stoic, Marcus Aurelius, would speak similarly over a hundred years later. In Meditations 12:3 he writes, “If you can cut yourself - your mind - free of what other people do and say, of what you've said and done, of the things that you're afraid will happen...” Again we are advised to cut ourselves free from past regrets and future worries. The effort, even violence, of the imagery speaks to me right now. I definitely feel the entanglement that comes with a focus on either the past or the future. I would love to gain some tranquility in the present moment, but cutting away the thoughts I’m wrapped up in will take real effort. Stoicism is present-oriented, and yet it doesn't ask us to live only for the moment. We all have projects, we are part of things that continue on (hopefully). We have to expend effort towards future events if we're going to flourish in our lives. But there's a way to do this that focuses on what we control rather than on what we don't. In my job hunt, I can't get someone to pick up my resume and call me for an interview, but I can send out that resume. I can't make my wife's work load any less, but I can take on tasks that ease the work at home and also make myself available for any other support she needs. And why wouldn't I do these things? After all, the things Stoicism asks us to cut away are wastes of our time and attention. They are things that we can never control. They are what Stoicism refers to as impressions and, in the case of imagined future events, these impressions can only be wrong ones. Latter in the same passage, Marcus also writes, "If you can cut free of impressions that cling to the mind, free of the future and the past...and concentrate on living what can be lived (which means the present)...then you can spend the time you have left in tranquility. And in kindness. And at peace with the spirit within you." Concentrate on living what can be lived. It's tremendous advice, if also difficult. I've known the tranquility, and peace, and also kindness, that comes from concentrating on the present. It's something I want and need to get back to. February 6, 2019 by Matt Van Natta.